A tiny tree was planted into the ground. It grew and became a wondrous sight. However, a strong wind tore a branch from The Family Tree. Witness how a family coped with a missing branch in this inspirational picture book for children, The Family Tree. So much of this story feels as though it was born from personal experience, the words flowing out. Overall, this was a delightfully refreshing book that caught me off guard. Children will enjoy it for the simple stories, adults will appreciate the deeper meaning. So well done. The Family Tree: The Night of the Storm by Laurie Copmann is truly is an all around good reading experience. Its tender approach to the storms of life and the loss they can leave behind brings hope and a fresh outlook. Its creative fabric illustrations add depth to its delight, along with the search-and-find activity on every page. The story is filled with sentiment. The illustrations are true works of art and love that embrace over 50 years of family history. Though most books won’t fit into a holiday stocking, I think books are the perfect holiday gift. I have selected The Family Tree: The Night of the Storm because I think this one is terrific. It tells a personal story with universal appeal through both written word and illustrations pieced from fabric. It took years to create-a true labor of love-and will resonate with children as well as adults. (Kids will love finding objects hidden within the artwork). 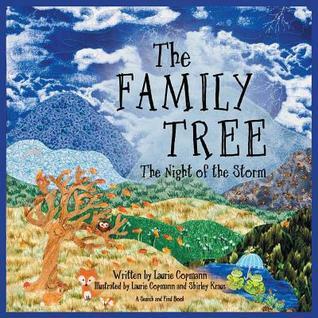 The Family Tree: The Night of the Storm by Laurie Copmann is a beautiful children’s book about a tree. The tree was planted long ago and had grown up to be a very magnificent tree that provided shade. One night, there was a big storm and a branch snapped off. The person who planted the tree went by with his granddaughter and saw that the branch was on the ground. The two of them decided to make it into a swing so that it would remain with the tree forever. I really enjoyed The Family Tree: The Night of the Storm by Laurie Copmann. The book is beautifully written and heartwarming. The characters are all very likeable and the story is very descriptive. The pictures, by Laurie Copmann and Shirley Kraus, depict the story very well. I liked that there were hidden items in each scene and enjoyed trying to find them, and young readers will enjoy trying to find them too. I liked how at the end it says what each hidden object represents and why they were chosen. I liked how the tree losing a branch represents the death of a family member and teaches about death without actually mentioning death. The story is very heartwarming, and the idea of the characters making the broken branch into a swing was very creative and gave the story a happy ending. I would recommend this book to all young readers. The Family Tree: The Night of the Storm book is truly amazing. It presents so many levels of diversity, from childhood to retirement. The lessons that are told are simple, but also very complex, in an easy manner to understand. The pictures are outstanding and the time and thought process put into it has made it appealing to every type of culture. I congratulate Laurie Copmann on a phenomenal piece of art and writing. I can see why she will have incredible success with future books. Dr, Hansen is the father of 13, with several adopted children. The Family Tree: The Night of the Storm is a positive read for the children. In their minds the story helps them understand the bigger picture. The message of hope and inspiration has helped them move past some of their pain and anger of feeling abandoned. Dr. Lynn A. Hansen D.C., N.D., D.C.B.C.N.